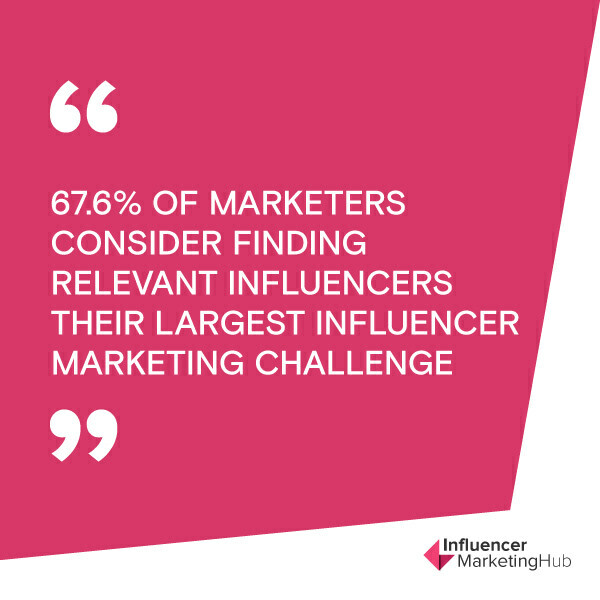 Influencer marketing is a form of marketing that has generated immense popularity over the last 5 years where individuals who have an audience to speak to, promote brands by creating content and “influencing” buying decisions. Influencers have been mostly identified as individuals who have a high following on social media in a particular space such as lifestyle, fashion, beauty etc. These influencers work with brands by creating their own photography, videos or writing to influence their following to favour that particular brand whether it be by converting online sales, driving traffic into stores or simply growing brand recognition. 2018’s top social media sites that host such influencer content include Facebook, Youtube, Instagram, Twitter, Reddit as well as an influencer’s own website/blog. Below we’ve simplified the list of top 10 most popular social networking sites that have held longevity in the marketplace over the last few years and their monthly active users. Why is influencer marketing so big? According to Ad Week, influencers have created a “world of possibilities” for “visionary marketers” who are able to connect with consumers in a more organic way. Buyers look towards other buyers to “influence” their purchasing decisions – a new and refined version of the good ol’ “word of mouth”. Brands who have failed to embrace social media growth and essentially influencer marketing have suffered a loss of brand recognition and sales. An example would be the growth of beauty influencers across social media over the last few years who have brought new brands to the forefront including Anastasia Beverly Hills, Sephora, Too Faced, Urban Decay and Benefit Cosmetics who have all used social media influencers to gain market share. In stark contract, brands who originally used other traditional methods to stay ahead such as Avon have fallen behind such as the reported 45.5 million bet loss for the June 30 2017 quarter. Here we see how although influencer marketing is new in contrast to other advertising efforts, it’s an extremely powerful tool when mastered. McKinsey reports that marketing through influencers generates more than “twice the sales of paid advertising”. How to run a good influencer campaign? Influencer Marketing began with contra arrangements – where brands were providing product in exchange for a post/mention or shout out. While a myriad of micro-influencers (influencers with smaller niche followings) are still engaging in contra arrangements, serious content creators and social media influencers with large followings and a good engagement rate are charging. Like you would to a sponsored Facebook ad or a radio mention, consider allocating a budget that will ensure you are able to work with an influencer who will fit your brand. Said influencer, if your campaign is effective, will spend much time creating content that will influence their audience and essentially provide you with greater brand recognition and a conversion of sales. 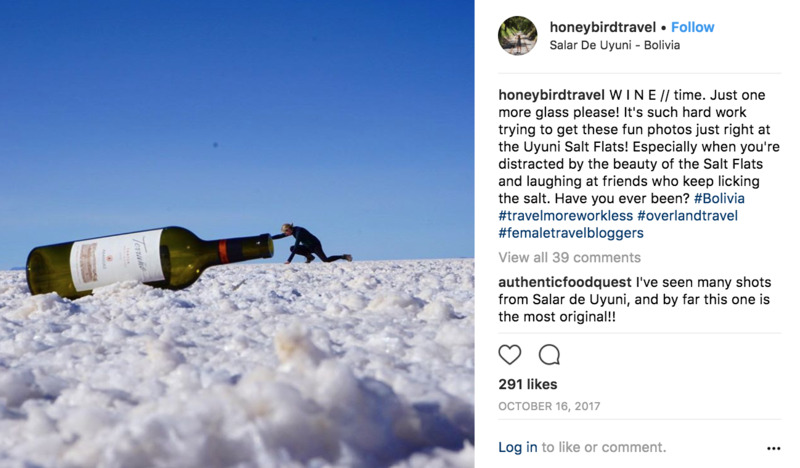 Travel influencer Jean Cheney of Traveling Honeybird uses a myriad of social media platforms and her own blog to curate interesting content for her audience. By using our Instagram Engagement Calculator we see that Jean has an engagement rate between 2-5% which is the ideal range, a good potion of likes and comments as per her Instagram following and content photography that is of value to a potential travel brand. A plethora of international brands search for influencers through our Influencer Directory and once they make contact and create an Influencer Contract (also available through our automatic contract generator or a free influencer contract template here) it is their responsibility to track and measure each campaign to find what works for them. For medium-large brands a yearly budget is allocated to influencer campaigns and thus it is a marketer’s role to ensure this budget reaches as many people as possible. - If your website traffic increased? - If you saw an increase in sales? Don’t simply pay an influencer for a social media post and then forget about them. Create an agreement with that influencer that ensures they like/comment on your photos. Your influencer campaign should include individuals that genuinely like or show an interest in your product (otherwise their audience will see past the “advertisement”) and likewise you should show the same engagement back. Like/Comment on their photos, record their special events and birthdays and send them free product just “because” and ensure your brand is worthy of being spoken about outside of their social media circle. Customers will soon begin to see that although being paid and/or provided with product, they are only showcasing your brand because they truly use or love it. With social media platforms creating facilities for tech businesses to grow, there will be an increase in the use of external tech companies to make influencer marketing easier. 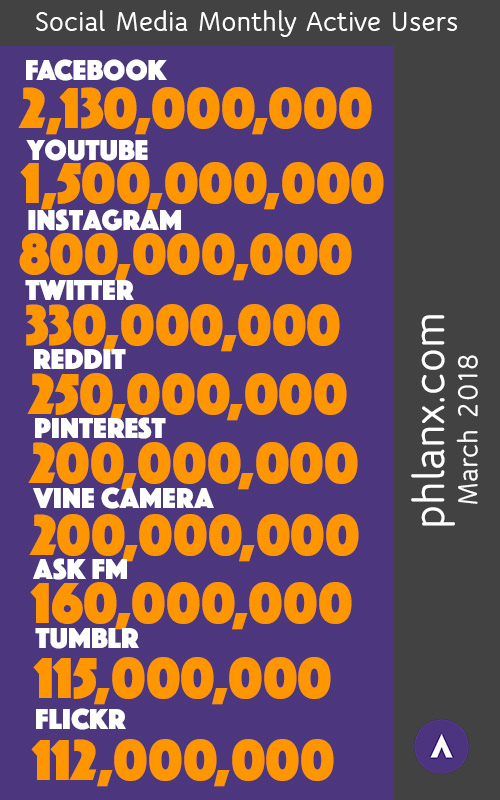 Phlanx.com has become a leader as an online marketing platform, where brands and influencers are using our technology to find and contact a directory of influencers, post and respond on a collaboration portal, measure their engagement, create contracts and generate online reviews. The development of such technology will make working with influencers this year much smoother. The laws of influencer marketing are very fresh, and the US was one of the first countries (given the majority of social media platforms originated from there) to provide guidelines for brands and influencers to follow. Canada, Australia, UK and Europe have followed in their footsteps with similar reminders of how to work together. The phlanx.com team believes brands and influencers will take the FTC guidelines more seriously in order to avoid customers arguing a lack of transparency and a potential PR disaster. Instagram specifically has created the branded content feature on their platform that ensures creators and publishers “tag business partners in their branded content posts when there’s an exchange of value between a creator or publisher and a business partner”. 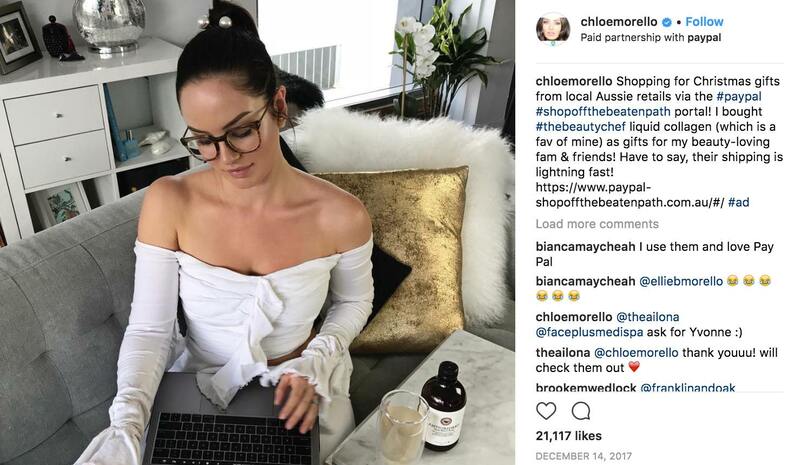 Here’s one of our favourite Australian beauty influencers Chloe Morello, with a solid engagement rate of 3.88% and a whopping 1million Instagram followers and 2.4million Youtube Subscribers who recently disclosed a paid partnership with Paypal, as the brand received an incredible 21,117 likes. This year, brands will contact influencers who have a following over multiple social media channels rather than just Instagram, YouTube or their own blogs solely. Influencers who have succeeded in more than 1 platform are more likely to have a greater influence, they reach a different variety of audiences and have distinguished themselves among others. Fitness influencer Kayla Itsines boasts of 9 million followers as she inspires her audience to maintain a healthy and it life. Kayla also owns the SWEAT APP which is reportedly worth a whopping 46 million. Here we see how Kayla has created an empire by using not only Instagram, yet her app to influence her own business audience. Perhaps this year your brand will venture out into other platforms and look for influencers that many brands have not worked with before. We mentioned that brands will begin to take measuring influencer success more seriously and thus we will see an increase in those brands providing influencers with tools for cross-measuring. Such tools include a UTM parameter (a tag to add to your URL so that when that link is clicked the tags are sent back to Google Analytics and measured) as well as promo codes they can share in their captions or URL that will allow brands to distinguish revenue per influencer. Brands will begin to become more clever in creating content alongside influencers. Rather than simply taking a photo of a product and mentioning they use it, perhaps that influencer will create a recipe, a certain “look”, a fitness regime or a HOW-TO on their YouTube. Brands and Influencers will compete in finding better ways to generate organic and authentic content despite the “sponsored” nature of their working relationship. 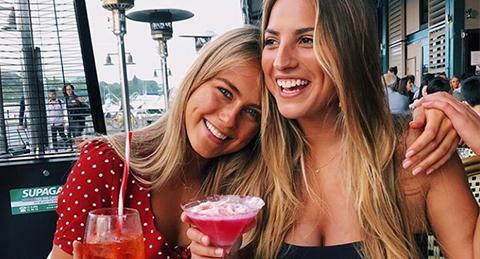 Another one of our favourite YouTube influencers Georgie Stevenson showcases what she eats in a day, her workout schedule and wedding preparation here. Although she showcases and mentions brands in her video, the content is engaging and more likely to influence her audience over a static mention. Overall the Phlanx.com team hopes that we’ve shed some light through this lengthy article on what Influencer Marketing is, where and how influencers share content, how to run a good influencer campaign and some influencer trends for 2018. How to master your 2018 influencer strategy? How to find the right influencers for your brand?